SPOILER WARNING: The below article contains spoilers for Game Of Thrones: Season Six, which you may wish to avoid if you have not seen this season of the show. Game Of Thrones can be a frustrating beast. Though it has the mythos nailed down, and the characters, it is not always a show that can bring its various moving parts to operate in a satisfying harmony. Unlike the show's metronomic titles, this has often been a series that does not go completely as clockwork, as often as it should. But season six is different. Season six is the moment the showrunners decided to let loose the satisfying plot payoffs, the heroic moments, the genuinely tear-jerking pathos. Characters stuck in the same arcs finally regained agency and did something. Characters with potential realised it. Characters we wanted to cheer for gave us reason to do so. 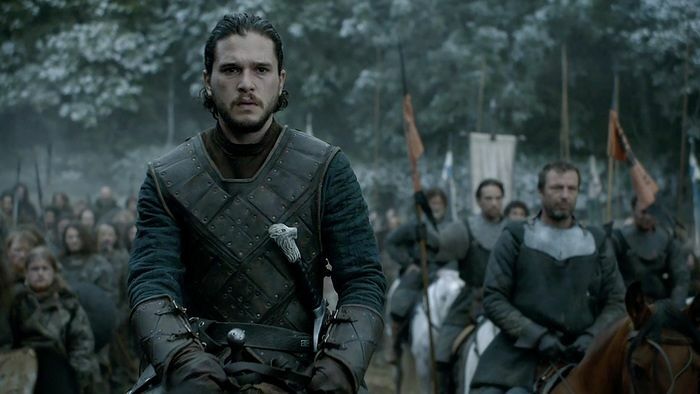 It didn't quite start off like that however, with the reveal about whether Jon Snow (Kit Harrington) would live or stay dead stretched out over the first two episodes. During those episodes it is difficult to think of anything not taking place in Castle Black as anything other than filler. Terry Pratchett used to say that his best characters (Vimes, Death, The Orangutan (ook)) feature sparsely because otherwise they would take over his world. If there's a criticism to be levelled at Game Of Thrones showrunners David Benioff and D.B. Weiss it is that they have occasionally allowed their ensemble fantasy drama to become The Jon Snow Show, without ever really giving us due plotting reason as to why. In season six you begin to get that reason and the way in which you get it - through flashbacks glimpsed by Bran's (Isaac Hempstead Wright) visions - is as important as what is revealed. Bran, another of the Game's characters often stuck on the periphery, suddenly becomes oh so important. The reveals he comes across matter to him, to us and to the wider world of Westeros, where before they have happened in cloistered microcosm. The pattern of Bran is repeated elsewhere. Sansa's (Sophie Turner) battle with Ramsey (Iwan Rheon) and uneasy alliance (if you can call it that) with Baelish (Aidan Gillen) surrounds the season's key moment. Arya's (Maisie Williams) inertia in the house of the many faced God finally ends and bear's fruit. Cersei's (Lena Headey) scheming comes to matter more than just impacting Kings Landing politics; there's direct cause and effect of her continued willingness to do the unthinkable. Even the most isolated characters - Daenerys (Emilia Clarke) and those inhabiting The Iron Islands - get things to do that matter beyond their immediate sphere of influence. Of the chips that are cashed in by the end of the season it is difficult to think of one that does not work. The reveal about Hodor (Kristian Nairn) is the most satisfying and emotional. So called 'mystery boxes' (read: good plotting) are easy to setup but difficult to payoff. This does both with shiver-inducing aplomb. The following episode heralds the return of an oft-mentioned character, in satisfying comic book hero-esque style. The demise of several villains during the wiping out of many cast members in the final episode gives equal levels of satisfaction. But this is, now, finally and justifiably so, the Jon Snow Show. The season revolves initially around whether he is alive and eventually around whether he can succeed. In a rare note of Thrones optimism (though the creators do get playful in season six; Tormund (Kristofer Hivju) is a constant highlight) we are left with the feeling that the Starks have the North again and can go much further than that. S6E9, Battle Of The Bastards, directed superbly by Miguel Sapochnik, gives us Stark tragedy and success in a single episode and doesn't only settle for that. The scenes where Jon looks as though he will asphyxiate feature incredible, and incredibly subtle camerawork, even if the conclusion of the episode is a little similar to several Thrones 'rescues' we have seen before. The problems season six has though are minor, particularly given how much it is willing to conclude and how much it manages to setup. By the finale, Arya and Daenerys are in (or very close to) Westeros. Cersei (Lena Headey) appears to have wiped out most of her immediate enemies, but is there a very attractive division with Jaime (Nikolaj Coster-Waldau) hinted at? It feels as though the conclusion of the Thrones labyrinth is approaching. In previous seasons I've been more than ready for it. At the end of season six, I could have watched TV of this quality for a lot longer.